The past year has been an exceptionally busy one for the American Numismatic Society, marked most recently by the acquisition of a huge amount of extraordinary material from the Medallic Art Company, America’s oldest private mint. Moving, storing, researching, and cataloging those items—many thousands of them, including medals, galvanos, dies, and much more—will keep us working hard for a few years. But their value to American history makes the work imperative, and for anyone who shares our commitment to scholarship and education, this project alone offers ample reason to keep the Society moving ahead at full power. 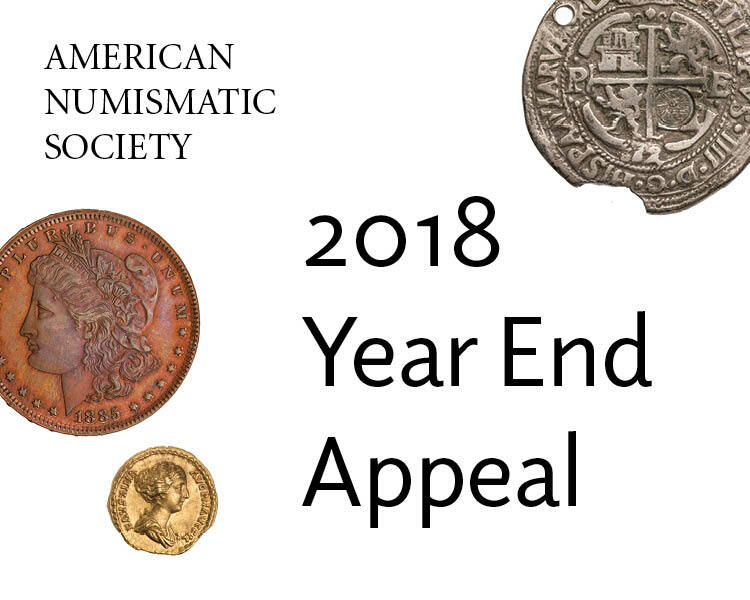 So as 2018 draws to a close, I once again ask all of you who share our passion for numismatics to make a donation to the ANS. Your support will allow us to continue the momentum that we have built up over this last year. With your help, we can continue not only to pursue unusual, once-in-a-lifetime acquisitions but also to continue the vital activities that make up our year: we can host the seminars and lectures, welcome visitors to view our collections, publish the books and journals, mount the shows, educate schoolchildren and young scholars, and expand our online offerings that make the Society’s holdings ever more accessible. So, please, make a tax-deductible donation to the ANS now, and secure our footing for the coming twelve months. Your contributions mean more than ever to the Society. Every donation, no matter the size, counts. A small gift that helps us keep the lights on or covers the cost of photographing a coin is just as necessary to us as one that allows us to publish a book or sponsor a curator’s research. All these donations add up to make possible the many and varied projects the Society undertakes. For an overview of highlights from fiscal 2018, please view our annual report, which is available online at: numismatics.org/annualreports. If you would like a hard copy of this report, let us know and we will happily send it to you. Thank you again for helping us with a successful 2018, and my very best wishes for the New Year.